Definitive Chief Customer Officer Jeanne Bliss delivers a must read for business owners who work within any vaguely customer-centric sphere. 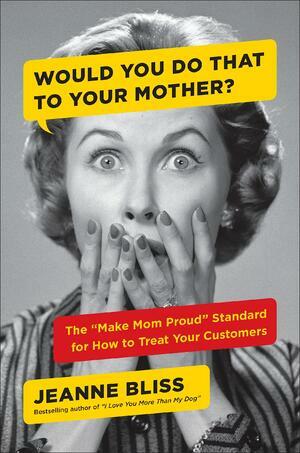 In her most recent book, Would You Do That To Your Mother Jeanne Bliss helps both employers and employees improve upon their customer experience. To do this, she uses a happy mixture of 32 case studies and her own vital expertise and experience. Through her emphasis on ethics and the "make mom proud standard", Jeanne injects a bit of humanity into the whole process of buying and selling. When we focus too intensely on profit margins and the bottom line, we forget what we're doing in business in the first place. Jeanne has spent her professional life encouraging others to do right by their customers, and this has resulted in the collation of a step-by-step manual on precisely how to implement great CX. If we all considered our mothers in our day-to-day business practices, not only would there not be a creased shirt in sight, but our processes would be all together more conscientious. In this episode we got Jeanne to chat to us about Would You Do That To Your Mother, her opinion on the industry and why mums deserve the highest praise. Jeanne is customer experience personified, so there is no-one better equipped to teach businesses how to get customers to love them. Her book may have a fun title but her content is overflowing with 32 case studies as well as the tools businesses can put into action immediately. We got Jeanne to talk about what drives her book: the make mom proud movement. Her book is not only about really good customer experience, but also brings to the forefront inspiring leaders, including examples of true leadership bravery. We also got Jeanne to dish on all the good (and bad) of customer experience. Virgin Hotels' switch to 'street prices' on their mini bars has impressed Jeanne, and we wanted to hear about the flip-side of the coin. While not willing to dig up dirt on specific businesses, Jeanne did warn about those who are focused on the "wrong metric" and willing to sacrifice customer happiness for high profit margins.